Attention, Harford County homeowners! Here are some outdoor lighting tips for you try out this weekend and every other night until September rolls around again. Attention, Harford County homeowners! Summer is here at last. If you’re looking to spend some more time outside, then you’re in luck. But the fun doesn’t need to stop once the sun finally goes down. Here are some outdoor lighting tips for you try out this weekend and every other night until September rolls around again. You never know when the next major heat wave will hit Maryland. Did you know that earlier this spring temperatures were higher in the Baltimore area than in California, Arizona, and Florida? When you think of those places, it probably won’t take you long before you remember how hot and in some cases, humid, they are. One way to spice up your outdoor lighting is to install a ceiling fan in your screened-in porch or patio. That way, you can keep cool air circulating to help keep you cool, even as you read a good book and drink some lemonade or have a chat with your friends and family. What parts of your Harford County home’s landscape are you most proud of? 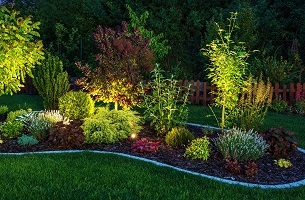 Emphasize them as points of interest with your new sources of outdoor lighting. You might need some wall lights if you wanted to make your outdoor kitchen the centerpiece, but that doesn’t need to be the only place where you start adding more lights. The next time you have a cookout at sunset or light up the firepit, you’ll probably want more light. Outdoor lighting can help you see what you’re doing, especially if one of your activities involves cooking or using fire. Uplights, downlights, candles, and lanterns can all add to the ambiance in your backyard and your outdoor living spaces if you arrange them in just the right way. It’s just so satisfying when you’re able to find the right amount of light for your plans. Another idea you could is to plan a movie night. Make your backyard into your own version of a drive-in movie theater, but with no cars needed and all the free popcorn and drinks that you want. All you need to do is add some more lights to make the screen easier to see. But when you run out of snacks or need a quick break, you’re going to need to see where you’re going. Don’t use up your phone’s battery with the flashlight feature – add more pathway lighting! This entry was posted on Friday, June 22nd, 2018 at 10:41 am. Both comments and pings are currently closed.